Every day, there is less and less people out there produce rock and roll the way it should sound. Most of the music out there today comes more from producers than it does from bands that are there simply to create music for the sake of making music. One band out there today that is making rock and roll that sounds real and authentic is Seattle-based rock band Custom. Custom consists of Jacque Hartless – Vocals, Corey Petro – Guitar, John Norton – Guitar, Paul Yarnold – Bass and Brandon Wilsey – Drums. The band is celebrating the release of their new CD entitled Flat Out Fast. Flat Out Fast from Custom begins with the track “Stop”. The driving beat of the track mixed with the power of the guitars from Cory Petro and John Norton creates a track with lots of energy. The interaction between Petro and Norton helps to add a lot of energy from the guitars to the music of the song and that energy makes for a perfect way to begin the release. The album continues with the song “Buzz Zone”. With this track, the band kicks up the energy of their music and also adds just a touch of humor to the band’s release. The lyrics “Well, I lost my mind. I never used it much anyway” lets you know that while the band seems to take music seriously, they still have a sense of humor. The driving pace of the music gives the music a lot of energy to go along with the humor that comes with every one of the unfortunate events that the singer sings about. After listening to “Buzz Zone,” you feel a lot better that it isn’t you going through all the bad luck that Jacques Hartless sings about in the song. The album continues with the song “Because of You”. The track begins with music produced exclusively by bassist Paul Yarnold and drummer Brandon Wilsey. The interaction between just the bass and drums creates a strong base for the rest of the band to build the music on. Once the rest of the group joins in, the resulting track feels like a Classic Rock track from a band that knows how to make use of their influences. The track brings back the feel of rock and roll and gives the listener just a glimpse of what music should sound like. The title track of “Flat Out Fast” brings to mind someone like Bon Jovi or other rock bands from back in the eighties. The vocals stylings of Jacque Hartless that bring to mind the sounds of strong rock vocalists like Robert Plant. The strong rock feel of the music and the strong pace of the song along with those vocals from Hartless create a track that rock lovers who miss the sounds of power rock will really enjoy. The title track for Custom’s new release of Flat Out Fast is just what you want for rocking out to. The track “Punching Sand” starts off slow as the music has and easy and light feel to it. That doesn’t last long as Custom picks up the energy and the pace of the music. The heavy feel of the music goes along with the lyrics of a person looking for a way to release a lot of anger. The track once again shows off the energy that Custom produces in its music. The band slows things down with the final track on the release, “Say Goodbye Again”. The slower pace of the music just seems to intensify the band’s music. The band works well on this track as they prove that faster is not necessarily better. Even with the slower pace, “Say Goodbye Again” proves to be one of the best tracks on the new release from Custom. From beginning to end, Custom’s new release entitled Flat Out Fast proves that rock and roll is still alive, as long as you can find it. The Seattle-based band takes the listener on a musical journey that will bring back memories of the rock and roll bands that really knew what music was supposed to sound like. And because Custom is currently creating the same type of music that seemed to have all but disappeared, the band’s new album of Flat Out Fast is just the thing if you have been looking for something new for your rock and roll collection. 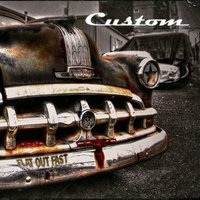 To check out the music from Custom, check out the band’s ReverbNation profile.